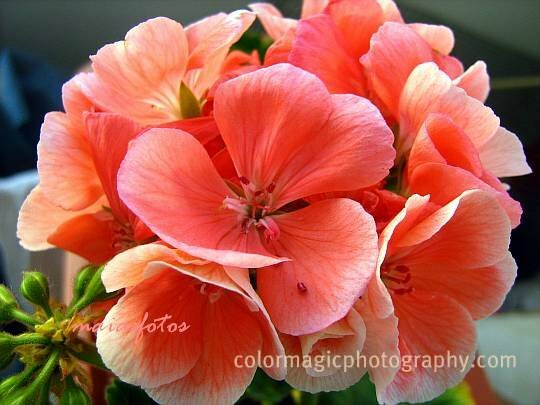 What a fantastic color your geranium has! Lucky you that you now has a full box with these lovely flowers! This is beautiful! I'm headed to the porch to take some photos right now! Maia, I never see enough geraniums. These are simply gorgeous. Great detailed shots. Geraniums are usually very forgiving, looks like this one did well. I love that color. I only noticed the centres of geraniums a couple of years ago - they are fascinating! I love the white edges on the petals, too! Great macro. Love the colour of the geranium. I have some in my garden but don't have that colour. Salmon coloured, so hard to find here in the tropics. We usually see the deep red and pink ones. Beautiful shot, Maia. Beautiful colors in this pretty flower. This geranium is a beautiful color. Nice Macro! Happy Saturday! Que Lindos gerâneos cor de rosa! Bom final de semana! Maia, thanks for the encouragement to take cuttings now. My geraniums overwintered in my basement but now are straggly and I need to do that. Yours sure look good! Maia, that looks spectacular! What a wonderful surprise to have on your windows! Beautiful colors, interesting texture. This flower gives off a beautiful light. Beautiful photo.